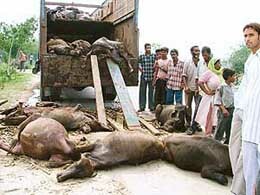 As many as 55 buffaloes were found dead in three trucks, under mysterious circumstances, when these trucks, carrying cattle for slaughtering were stopped by some animal lovers near Grain Market in the wee hours today. As gastroenteritis claimed its first victim as the local residents in more than six colonies have been affected with the disease, the threat of malaria also looms large in the city. Adi Dharam Samaj, a representative group of the Valmikis constituting a major group among the Dalits, has criticised the appointment of Mr Shamsher Singh Dullo as the president of the Pradesh Congress Committee (PCC). The unemployed ETT teachers lodged in the Central Jail here have further intensified their fight against the alleged repression and injustice inflicted upon them by the state government. Mr Jagpal Singh Khangura, a senior Congress leader and in-charge of Kilaraipur constituency, inaugurated the work on the Pohir-Lohatbaddi road at a function organised in Chhapar village here yesterday. The newly appointed President of the Punjab Pradesh Congress Committee, Mr Shamsher Singh Dullo, was today honoured at a function organised by the Bairagi Mahamandal, Punjab. Former Chief Minister and the president of the Shiromani Akali Dal-Badal, Mr Parkash Singh Badal, today demanded a CBI probe into the allegations levelled by the Director General of Police, Punjab, Mr S.S. Virk against the Shiromani Akali Dal-Amritsar president, Mr Simranjit Singh Mann. Mr Virk had recently alleged that Mann had collected huge money from foreign countries to fund terrorist activities in the state. 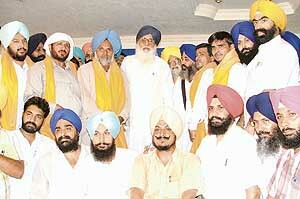 Mr Parkash Singh Badal, SAD chief, today accused the Centre and the state government of interfering in the affairs of Sikh religious organisations in India and abroad. The workers’ training camp of the Bhartiya Janata Party (BJP) that was organised here today proved to be a low-key affair with most of the party leaders remaining inactive. The district administration has invited applications from social and voluntary organisations that have done outstanding and innovative work for the development of women in 2004 for the Dr Durgabai Deshmukh Award constituted by the Central Social Welfare Board which carries a cash prize of Rs 5 lakh, a citation and a shawl. The entries should be submitted by July 25. What the government machinery could not do for the past at least five years, some volunteers, motivated by the Chairman of the Ludhiana Improvement Trust, made it possible within a few hours only. Ice-cream sellers, who use deep freeze for ice-creams are having a difficult time due to the bad power scenario. Long power cuts have badly hit the ice-cream business. The sellers are having difficult time as the customers who open the wrappers of ice candies return it that after seeing their shapes. Complainants turned accused at least in three cases reported at respective police stations in Sangrur and Jagraon police districts. Pawandeep, a powerlifter, who is also a local resident, is among the four Punjabis selected for the final selection trial for inclusion in Indian team for the forthcoming Sub-Junior World Powerlifting Championship. The championship is scheduled to commence in the USA from September 5. 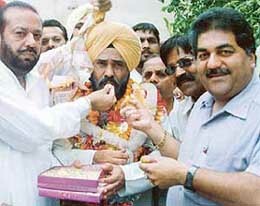 Gurraj Singh (29), a resident of Roomi village, was killed when he was hit by an unidentified vehicle near his village. A case has been registered under Section 304 of the IPC. The body was handed over to the relatives of the deceased after the post-mortem examination. The Sunder Nagar police today arrested two notorious smugglers who were using a noval way to smuggle liquor in the city from Haryana where it was available at cheap rates. The smugglers were bringing the booty in an Ambassador car that was made up to look like the official vehicle of some senior Punjab Police officer. The industrialists of Mandi Gobindgarh — the steel city of Punjab — have sought early clearance of steel cluster which had been promised by the ministries of commerce and industrial promotion of the Ministry of Industry. Sixty girl students from Jugiana, Sahnewal and Dhandari Kalan villages visited Apparel Training and Design Centre to attend an awareness programme on training courses in textiles. The Public Cause has demanded early appointment of the lecturers selected by the Punjab Public Service Commission a few years ago. The social organisation said more than 750 posts of lecturer out of 2291 posts were lying vacant in government colleges in Punjab. A team of doctors from the local Civil Hospital today examined students of St Bawra Public High School in New Lajpat Nagar at a medical camp organised on the school premises. 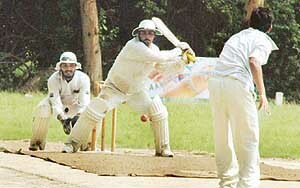 A hurricane innings of 72 runs by Bhuvnesh steered Jai Bhawani XI to three-wicket win over Sunrrise Club to the final in the second Bholan Devi Memorial Cricket Tournament played at the Government Model Senior Secondary School ground of the Punjab Agricultural University, here today.